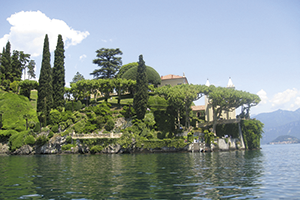 Our Italian Garden Tours are always in demand. Sometimes it is due to Monty Don’s Italian Garden programmes. The beautiful regions, local people and their gardens are fascinating and we also chose restaurants with seasonal, locally grown produce. The Medici created gardens in Florence and the surrounding hills in the 16th century with grottoes, statues, boschetti and waterworks. In later times, gardens were designed in conjunction with the villa to create a harmonious perspective, and terraces were much favoured. 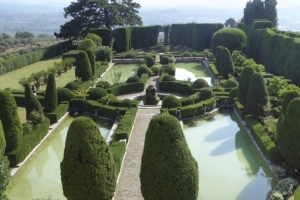 The early 20th century marked the revival of the Italian formal garden. This rich heritage offers a fascinating programme of gardens for our tour. Mostly private, they form a good balance encompassing the different periods. Our appreciation of these outstanding Tuscan gardens is complemented by wine tasting, and by a visit to Impruneta where terracotta pots were first made for the della Robbia, Renaissance masters of the art of enamelling the material. September is a delightful season to visit the region. We stay initially in the vibrant city of Florence with its art treasures, churches and markets. 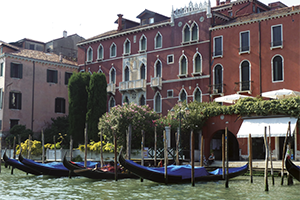 Our comfortable, welcoming hotel situated a few minutes from the duomo is a perfect base. A former palazzo, or grand town house, dating from the 16th century and now well restored, it retains its frescoed ceilings and architectural features. We then move to Pienza, south of Siena, and finally on to the walled medieval city of Lucca. Gardens of Provence is our featured French Garden Tour this year. 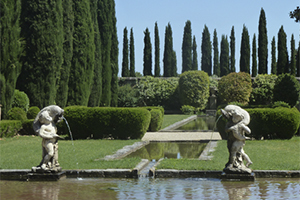 The gardens are all privately owned and rarely visited; leading designers were involved in the creation of the gardens ingeniously planting amongst pencil cypress, olive trees and rows of lavender. Hotel La Mirande in Avignon is an exceptional hotel and a perfect base for us. We visit South African gardens of the Cape in late October, their late springtime and a perfect escape from the oncoming winter in the northern hemisphere. Mostly private gardens in stunning landscapes are enjoyed and of course Kirstenb. We add a few days in the hinterland to discover the wildlife and exceptional flora (fynbos) of the Little Karoo and the coast. An experience not to miss! The Western Cape garden tour combines beautiful gardens at the start of summer with the flora and wildlife in the spectacular hinterland of the Little Karoo and the mountainous coastline. The region has a Mediterranean climate, abundant sources of water, mostly acid soil and above all a rich indigenous flora and exceptional gardens. Some surround delightful Cape Dutch manor houses, others are extensive plant collectors’ gardens and some with contemporary design. Kirstenbosch gardens have an exceptional collection of plants only of the Cape in a stunning location at the foot of the Table Mountain Range. One of the most recently created gardens is Babylonstoren which is spectacular in its design and concept. 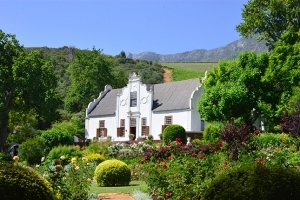 The Winelands town of Stellenbosch is our base to discover the fabulous private gardens of the Cape. Oude Werf Hotel is in the centre of Stellenbosch, a university town with eye-catching Cape Dutch architecture. It has many street cafes, good shops and restaurants. We visit the national park of Cape Point with its rich indigenous fynbos vegetation and superb vistas. We continue to the remote Little Karoo hinterland to stay at the Sanbona Wildlife Reserve of 52,000 hectares. This reserve is involved in the re-introducing and conserving wildlife eradicated over a century ago and encouraging the rich wild flora. We leave over the mountains for the coastal region to the superb private nature reserve lodge at Grootbos surrounded by a milkwood forest and rich coastal fynbos. There is a chance to whale watch in Gansbaai.